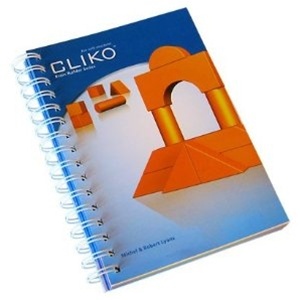 In Cliko players attempt to reconstruct 3D structures based on 2D horizontal flat views. Given an illustration that mimics what you would see through a camera's viewfinder, and the type and number of blocks required, your child will be asked to construct a three dimensional structure that conforms to the image. As they work through the exercises, and the illustrations become exceedingly difficult, your child will be given additional views of the illustration for help and clarity. While providing solid educational skills, it's also captivating and exciting! Cliko is part of the Architect line, which consists of 4 exquisite games of spatial visualization. The focus of Equilibrio, is building vertical shapes. In Tangramino players replicate 2 dimensional images using Geoblocks. Architecto focuses on translating 2D into 3D designs, while Cliko emphasizes perspective, depth, and geometric forms. In each of these games, players progress at their own rhythm, as puzzles gradually become more challenging. All games use the same set of Geoblocks and a spiral book with 6 color-coded levels of difficulty. The easiest puzzles in each book will engage your child. The most difficult puzzles will challenge most adults.